The EDIWTB online book club is back! 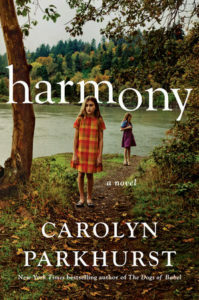 This month’s book club choice was Harmony, by Carolyn Parkhurst, which comes out today. Harmony is about the Hammond family, parents Alexandra and Josh and daughters Tilly and Iris, who live in Washington, DC. Tilly is on the autism spectrum with a diagnosis of PDD-NOS (pervasive developmental disorder, not otherwise specified). She has been asked to leave her school because the administrators say she is too disruptive and that they cannot help her anymore. Alexandra, at the end of her rope after homeschooling and seeing little improvement in Tilly’s behavior, turns to the guidance of a parenting consultant named Scott Bean. After months of private sessions with Scott, Alexandra persuades Josh to move the family full-time to a compound in New Hampshire, where Scott is creating a camp for families with children who have developmental disorders. Harmony is told in alternating vantage points and through flashbacks. Iris, Tilly and Alexandra share the narration, and the setting switches back and forth between the summer of 2012 in New Hampshire to earlier years in D.C.
Camp Harmony, premised on the notion that kids need an environmental detox in order to address their developmental issues, is governed by Scott’s many rules. No cell phones. No processed foods. Adults must turn over the keys to their cars. Families who live at Camp Harmony full time handle the cooking and cleaning. As the book progresses, Scott’s rules become more arbitrary and his calm veneer less smooth. Is he who he says he is? What are his motives? The book reaches a climax when the Hammonds are forced to confront the truth about Scott and come to terms with why they are in New Hampshire and whether it is helping. Harmony is, at its core, about the helplessness and desperation of parenthood, the innate desire to do whatever it takes to cure your children of their ills. I spent a lot of the book wondering whether I could see myself in Alexandra and Josh’s shoes, selling my house and most of my belongings and putting my trust in another person to do what was right for my family. Parkhurst did a good job of building her case here. She chronicles Alexandra’s increasing despair, her willingness to try anything, as remedies and therapies and curriculae fail Tilly, one after another. She also allows Josh and Alexandra some skepticism and rebelliousness at Camp Harmony to show that they are more than just blind adherents to Scott’s will. She makes Scott reasonable and compelling enough that his brand and ideology seem credible. And then she shifts the narration to Iris so that the the reader can see what’s really going on. I really liked Harmony. 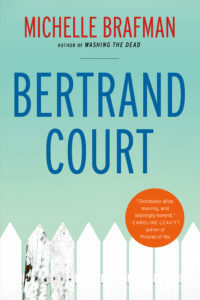 There are some plot holes, and the ending was a little abrupt and unrealistic, but I thought Parkhurst did an excellent job of exploring the challenges of parenting a child on the spectrum. (I also loved all the D.C references.) Harmony was a fast-paced read, yet it is full of details that make you feel like you’re right there at the camp with the Hammonds. I am a big Parkhurst fan, and this one didn’t disappoint. OK, EDIWTB book club, what did you think? Return of the Online Book Club! I am excited to announce that the EDIWTB Online Book Club is back! Here’s how the online book club works. I choose a book, and EDIWTB readers who are interested in participating sign up by sending me their name, email address and home address. Participants receive a copy of the book in the mail, courtesy of the publisher. About a month later, on a pre-selected date, I post a review of the book here, and then the book club discussion takes in the comments section of the blog. It’s a lot of fun, and all you have to do is be one of the first 15 to sign up. I will let you know if you’re one of the first 15 to sign up. Thank you to Penguin Random House for providing the books! 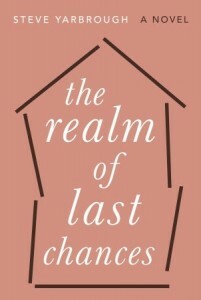 The February online book club pick was The Realm of Last Chances by Steve Yarbrough. The discussion of that book will take place today here on EDIWTB, with the participants commenting below. The Realm of Last Chances is about Kristin and Cal Stevens, a married couple who moves from the Central Valley of California to Boston after Kristin is laid off from her college administration job in California. She finds another job at a third-tier college outside Boston, and the two start their lives over again on the East Coast. However, it turns out only to be a fresh start geographically. The couple, who had been growing apart in California, find themselves even more distant from each other in their new home. Cal, who was a handyman in California, spends his days playing stringed instruments and fixing up their new house. Kristin finds herself embroiled in new but familiar challenges facing college administrators, such as professor plagiarism and tenure negotiations. As the book progresses, we also learn about the skeletons in Kristin and Cal’s closets – failed marriages, broken homes, violence – and how they shaped the main characters. Matt Drinnan, the Stevens’ neighbor and a man with his own troubled past, meets the couple shortly after their arrival in Massachusetts. Ultimately his relationship with Kristin drives her and Cal further apart, as he seeks his own reinvention and redemption for his own transgressions. The good: I liked the glimpse The Realm of Last Chances gave into these unusual characters’ lives. I feel like I read so many books about urban thirtysomething parents, and it was refreshing to explore the lives of these struggling middle-aged suburbanites. Yarbrough’s writing is crisp and descriptive. There are themes throughout the book – infidelity, forgiveness, and how well we really know our partners – that I thought Yarbrough skillfully weaved among multiple characters and contexts. However, I don’t think I really got this book. I found a lot of it implausible – how could Kristin and Cal have been so incurious about each other’s pasts? do people really ask relative strangers to hold them? can one really read lips looking through a window between homes? – and much of the rest of it was either too convenient or just kind of boring. I got to the end of the book, which felt slapped on and too tidy, and wondered what the point was. I didn’t feel very optimistic about these characters’ futures – they just kind of limped off into the sunset. I enjoyed the beginning of The Realm of Last Chances more than the end. Kristin and Cal’s disorientation upon arriving across the country, her introduction to her new job – those were compelling. As the story progressed, however, it sort of lost me. The plagiarism storyline didn’t make much sense to me – how was Kristin to blame for how the story came to light? – and the grand reveal about Cal’s violent past seemed inopportune. Depressing-o-meter: 6. It’s gloomy and defeatist at times, but ends on a positive. Goodreads abounds with very positive reviews of The Realm of Last Chances, so there are clearly many fans of this book out there. I am eager to hear what the other book club participants felt about the book. Did it grab you? Did you find the plot to be plausible? Do tell. Thanks to Knopf for facilitating the book club! I am excited to announce the next EDIWTB online book club! If you’re new to the book club, this is how it works: I choose a book, and the first 20 EDIWTB readers who want to read it get a review copy from the publisher. Once the book gets sent out, you will have about 3 weeks to read it. Then, on a pre-selected day, I post a review of the book here on EDIWTB, and the conversation around the book continues in the comments section. That’s it! Very simple. When Kristin Stevens loses her administrative job in California’s university system, she and her husband, Cal, relocate to Massachusetts. Kristin takes a position at a smaller, less prestigious college outside Boston and promptly becomes entangled in its delicate, overheated politics. Cal, whose musical talent is nothing more than a consuming avocation, spends his days alone, fixing up their new home. And as they settle into their early fifties, the two seem to exist in separate spheres entirely. At the same time, their younger neighbor Matt Drinnan watches his ex-wife take up with another man in his hometown, with only himself to blame. He and Kristin, both facing an acute sense of isolation, gravitate toward each other, at first in hope of a platonic confidant but then, inevitably, of something more. The Realm of Last Chances provides us with a subtle, moving exploration of relationships, loneliness and our convoluted attempts to reach out to one another. Please don’t skip lines – just send it in a block that I can cut and paste. I will submit the first 20 names to Knopf for review copies. Thank you to Knopf for again facilitating the book club!